Add what you’d like to your cart and choose Affirm at checkout. Checkout is simple with Affirm. Just enter a few pieces of information for a real-time decision. Pick a loan that fits your budget. You’ll make real progress every month, and at the end of your loan, you’re free and clear. 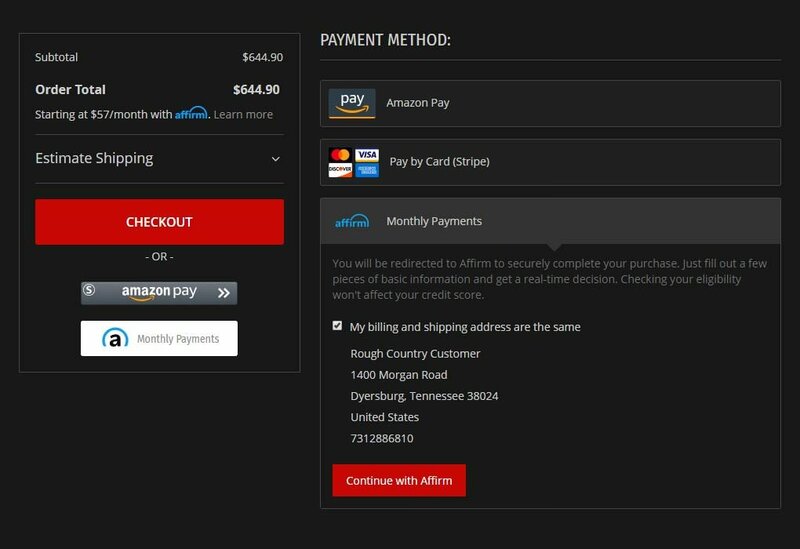 Affirm connects directly to online stores. There’s no card number to steal, so your account stays secure. Find out more. Paying with Affirm is quick and easy. Once you have added your products to the cart, simply choose "Affirm Monthly Payments." Fill out your billing and shipping information, then proceed to the Affirm website to get a real-time credit decision. Pick a loan that fits your budget, confirm your order, and you're all set - no hidden costs and no surprises. For a limited-time Rough Country is offering a promotional rate of as low as 0% APR financing on orders over $500 for qualified buyers for up to 24 months. Even if not approved for the promotional rate, many applicants will still enjoy financing through Affirm with great rates on 3, 6, 12, 18, and 24 month terms! For example, a $1000 purchase may cost $41.67 / mo over 24 months at 0% APR. A down payment may be required. Any United States resident 18 years or older (19 years old in Alabama or if you’re a ward of the state in Nebraska) is eligible to use Affirm. Please note Affirm is only valid in the United States and is not currently available to West Virginia or Iowa residents.